Immigrant families are being threatened. DAOK's deportation defense efforts require all hands on deck. We are working tirelessly to help as many DACA applicants as possible renew, and we are strategizing how to locally stop deportations of our friends, neighbors, and loved ones. Will you join our mission with a donation? DAOK is a 100% volunteer-based organization that aims to empower the local immigrant community through advocacy and education to ensure justice for all immigrants. We do this through education, advocacy, civic engagement and community service in the state of Oklahoma. Every donation counts. We can't make a lasting impact without YOU! 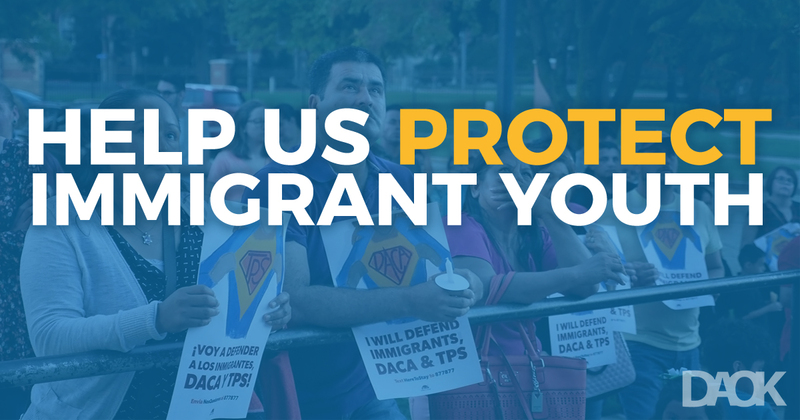 OUR IMMIGRANT YOUTH NEED YOU! You may receive updates from DAOK-OKC, the sponsor of this fundraiser. Dream Action Oklahoma (DAOK) is a project of United We Dream Network, Inc. (UWDN), a 501-c-3 charitable organization. Donations made to UWDN on behalf of DAOK are tax-deductible to the extent allowed by law.